The annual Basket Day is set for Saturday at Northwestern State University’s Williamson Museum, a tradition that started 44 years ago. 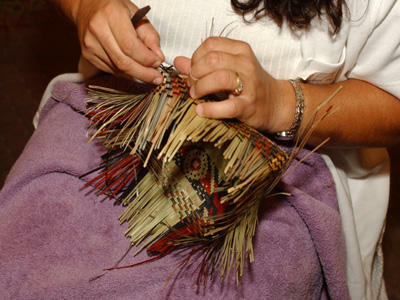 A Chitimacha basket weaving demonstration by a member of the Native American Chetimachan tribe who come from St. Mary Parish near Bayou Teche. Craftspeople from at least four Native American tribal communities in Louisiana and Mississippi will gather in Natchitoches to sell baskets, bead work, pottery, wood carving and other handmade traditional items. Northwestern State anthropologist Pete Gregory directs the museum. It recently acquired a collection of hundreds of Native American baskets. Gregory says Basket Day is hosted by the university’s anthropology club as a way to show support for American Indian arts and culture. Members of the Tunica-Biloxi tribe will perform songs in their native language. These songs, he says, are at least 1,000 years old, and the tribe is working to keep the language alive. Gregory has taught at NSU for 54 years. He’s witnessed how craftspeople have passed on the basketry tradition for generations. He says native artistry is being nurtured now more than ever because there is more economic stability and education among people with tribal affiliations. Members of the Choctaw use the Williamson Museum as a gathering place, and its collections have reflected the maintenance of tribal arts for decades. Basket Day will be held from 9 a.m. to 3:30 p.m. in NSU’s Kyser Hall, room 208. The Tunica-Biloxi song performance is set for around 11 a.m. Basket Day is held each year on the same day as the Natchitoches Christmas Festival.